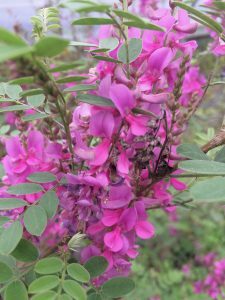 Incredibly tough and beautiful deciduous shrub that is fantastic all summer with a continuous supply of spikes of deep pink pea flowers all summer. To 7′ x 5′ in 5 years in average to rich soil (where it will grow MUCH larger) and light summer water. Very drought adapted when established. 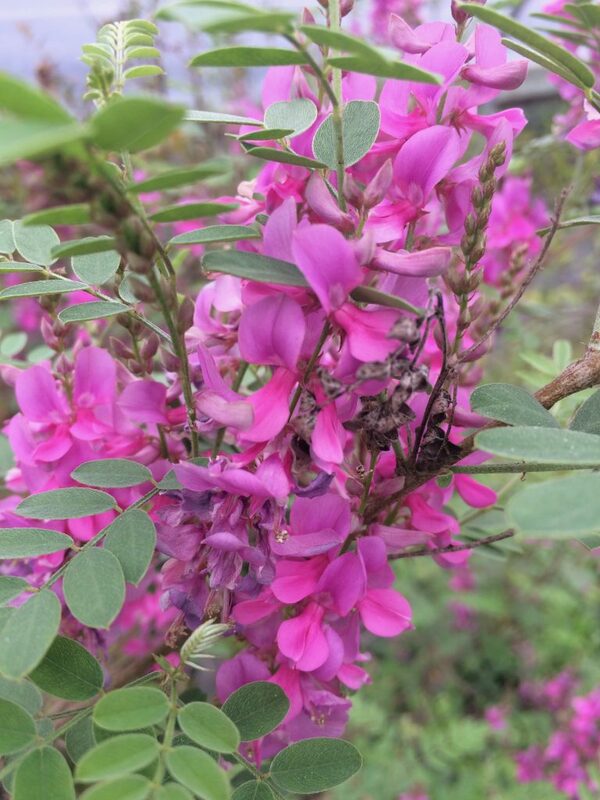 Flowers are produced on new wood (growth from the current season) and as the plant grows it continually blooms. Loved by pollinators and it attracts the very coolest butterflies. Vivid flower color pairs well with dark foliaged plants. It may be cut back hard in early spring when established to provide more blooming wood, or to check the size. Very cold hardy. Purple Indigo. Moderate deer resistance.